Way back in 2006 or so, in the first Project VRM meetings, our canonical use case was ‘change of address’; that is to say, we wanted individuals to have the ability to update their address in one place and have that flow to multiple suppliers. We did not note the need at the time, but there probably should have been one around ‘standardised data sharing terms’ so that organisations would not get tied in legal knots signing many different contracts to cover themselves as they would need to do. So, 12 or so years later, that proved to not be quite so easy….. I think our most flawed assumption was that organisations would see this as a good thing and be willing to get involved. No matter, the reason for my post is to flag that individual driven change of address can now be done at Internet scale, albeit yes we still need to crack the adoption issue. There are also then a number of downstream use cases, e.g. where the address change must be verified. 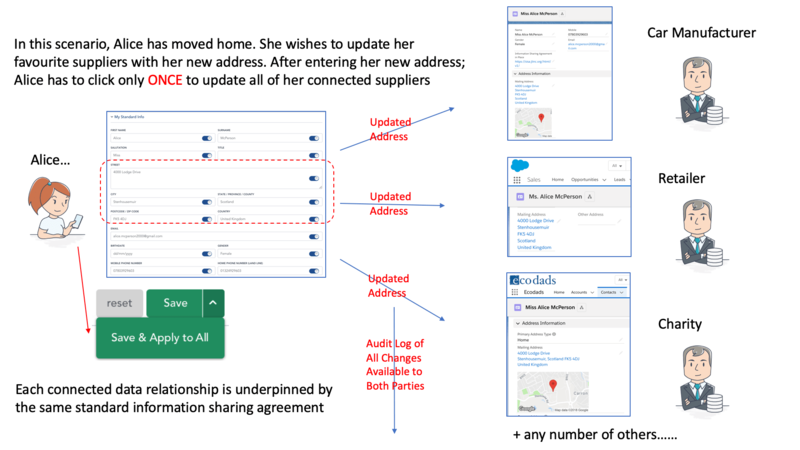 Here’s a visual of how change of address works in the JLINC environment; the same principles could apply in other environments. The critical dependency is that both parties (individual and organisation) have their own data-sets that they voluntarily connect to each other. Beyond the fact that this plumbing now demonstrably works at scale, I think the most interesting thing that has emerged from the JLINC deployment is the Standard Information Sharing Agreement. The requirement here is to have an agreement that works for both parties; here is the initial one built for JLINC. The expectation is that these will evolve over time and likely become life aspect/ sector specific (e.g. Health); but critically they will not mimic the current model where each organisation invents their own. The secondary function that I believe makes this scale is the ability to record every single data exchange that takes place should either or both parties need to refer to that downstream. So, we can now tick the box around ‘change of address’, at least as working plumbing. The better news still is that the same plumbing and approach works for any type of data, or any data flow (so organisations sending data to Alice too). At least it should not take another 12 years to make that next use case work, which incidentally was ‘Intentcasting’; i.e. an individual being able to articulate what they are in the market for without losing control over that data. That’s what we’re starting this Thursday (26 April) at GDPR Hack Day at MIT. The GDPR‘s “sunrise day” — when the EU can start laying fines on companies for violations of it — is May 25th. We want to be ready for that: with a cookie of our own baking that will get us past the “gauntlet walls” of consent requirements that are already appearing on the world’s commercial websites—especially the ad-supported ones. Which you can also see in a search for GDPR. Most of the results in that search are about what companies can do (or actually what companies can do for companies, since most results are for companies doing SEO to sell their GDPR prep services). Un-complicate things (for example, relieving sites of the need to put up a wall of permissions, some of which are sure to obtain grudging “consent” to the same awful data harvesting practices that caused the GDPR in the firs place). What we propose is a friendly way to turn off third party tracking at all the websites a browser encounters requests for permission to track, starting with a cookie that will tell the site, in effect, first party tracking for site purposes is okay, but third party tracking is not. Photos from the session start here. Click on your keyboard’s right (>) arrow to move through them. Session notes are on the IIW wiki here. A privacy manager or privacy dashboard on the user’s side, with real scale across multiple sites, is inevitable. This will help bring one into the world, and sites should be ready for it. Additions and corrections to all the above are welcome. So is space somewhere in Cambridge or Boston to continue discussions and hackings on Friday, April 27th. — is by proffering terms of their own. That’s what will happen when sites and services click “accept” to your terms, rather than the reverse. The role you play here is what lawyers call the first party. Sites and services that agree to your terms are second parties. Agreeing with us can make sites and services compliant with tough new privacy laws. It relieves them of the need to track us like animals everywhere we go, and harvest personal data we’d rather not give anybody without our permission. It provides simple and straightforward “brand safety” directly from human beings, rather than relying on an industry granfalloon to do the same. It lets good publishers sell advertising to brands that want to sponsor journalism rather than chase eyeballs to the cheapest, shittiest sites. It provides a valuable economic signal from demand to supply in the open marketplace. We’ll have other terms. As with #NoProfiling, those will also align incentives.